The FOAMEE stands on its own or is an excellent ship-to-shore boat for any larger boat. The FOAMEE can be rowed or powered with a small outboard in addition to its being a first-rate sailing trainer. 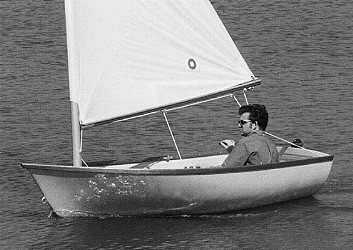 The FOAMEE sailing dinghy uses "one-off" sandwich core construction with fiberglass laminates inside and out. This is an excellant beginning craft for anyone who would like to try out the method before attempting one of the larger one-off designs. One-off fiberglass construction allows boats to be built in hull forms that are not possible using sheet plywood. The finished product has the "molded" look that we are familiar with from fiberglass production boats, but using a method that requires no expensive female mold. For more information on sandwich core construction, see "Building Methods/Fiberglass". The pictures used to illustrate sandwich core construction are of the FOAMEE. NOTE: Although not detailed in the plans and pattern package, we have had several builders make this boat using the "cold-molded" wood veneer method. The hull form is well suited to cold-molded construction.